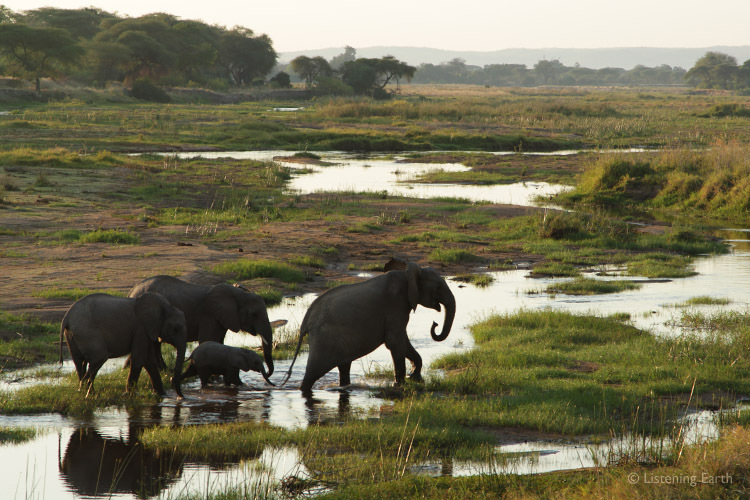 Come on Safari, and get close up to Africa's amazing wildlife! Our listening safari begins in the pre-dawn with gentle birdsong, the haunting wail of hyena and the distant trumpeting of an elephant. As we journey out onto the savannah and woodlands, we hear the calls of impala and monkeys, herds of wildebeest on migration, the braying of zebras and the mighty roars of a pride of lions. Birdsong abounds, including animated flocks of social weaver birds. At the end of a day, we are treated to a gruff cacophony from hippos wallowing in a pool, the cries of bush babies, and the low growls of a secretive leopard. 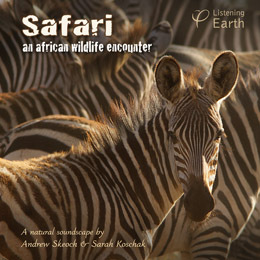 "These recordings present some of the highlights from nearly 2 months of recording in Africa. Our microphones spent many hours out in the landscape, risking their existence to capture these sounds. They survived, and we were lucky to get some very up-close and atmospheric recordings of wildlife, often of animals literally walking past the microphones! This album is not for the faint-hearted, or those seeking a relaxing listen, but it does offer a fascinating experience of the real wild Africa."